U.S. Defense Secretary Chuck Hagel (L) listens to Lieutenant-General Wang Guanzhong, deputy chief of the general staff of the People’s Liberation Army, during the start of their meeting in Singapore. The United States and China squared off at an Asian security forum on Saturday, with the U.S. defense secretary accusing Beijing of destabilizing the region and a top Chinese general retorting that his comments were “threat and intimidation”. Using unusually strong language, U.S. Defense Secretary Chuck Hagel took aim at Beijing’s handling of territorial disputes with its Asian neighbors. “In recent months, China has undertaken destabilizing, unilateral actions asserting its claims in the South China Sea,” Hagel said. He warned Beijing that the United States was committed to its geopolitical rebalance to the Asia-Pacific region and “will not look the other way when fundamental principles of the international order are being challenged”. His speech at Singapore’s Shangri-La Dialogue, Asia biggest security forum, provoked an angry reaction from the deputy chief of staff of the Chinese Army, Lieutenant-General Wang Guanzhong. “I felt that Secretary Hagel’s speech is full of hegemonism, threat and intimidation,” he told reporters just after the speech. Wang said the speech was aimed at causing trouble in the Asia-Pacific. Hagel’s comments followed the keynote address by Japanese Prime Minister Shinzo Abe at the same forum on Friday evening, who pledged “utmost support” to Southeast Asian countries, several of which are locked in maritime disputes with China. “I felt that they were just trying to echo each other,” Wang said. 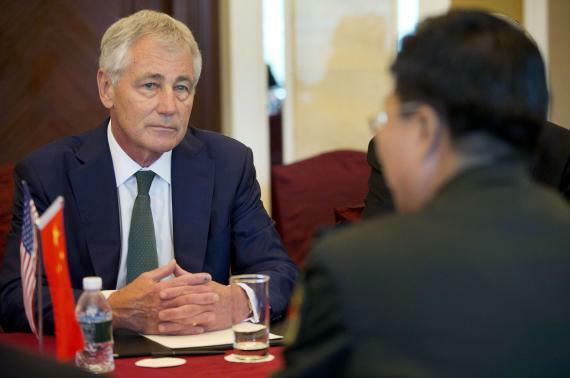 Hagel later held a bilateral meeting with Wang, where the Chinese military leader expressed his surprise at the U.S. defense secretary’s speech. A senior U.S. defense official said that, despite Wang’s opening remarks, the tone of the meeting had been “businesslike and fairly amicable”. While Hagel went over ground he covered in his speech, Wang spent most of the meeting talking about U.S.-China military-to-military contacts, including Chinese participation in forthcoming military exercises, the official said. The U.S. official said Hagel’s speech had been well received by other Asian delegations with the exception of China. In Beijing, President Xi Jinping said China would not initiate aggressive action in the South China Sea but would respond if others did, the official Xinhua news agency reported. “We will never stir up trouble, but will react in the necessary way to the provocations of countries involved,” Xinhua quoted Xi as saying in a meeting on Friday with Prime Minister Najib Razak of Malaysia. China claims almost the entire oil- and gas-rich South China Seas, and dismisses competing claims from Taiwan, Brunei, Vietnam, the Philippines and Malaysia. Japan also has a territorial row with China over islands in the East China Sea. Tensions have surged in recent weeks after China placed an oil rig in waters claimed by Vietnam, and the Philippines said Beijing could be building an airstrip on a disputed island. Japan’s defense ministry said Chinese SU-27 fighters came as close as 50 meters (170 ft) to a Japanese OP-3C surveillance plane near disputed islets last week and within 30 metres of a YS-11EB electronic intelligence aircraft. Japanese Defence Minister Itsunori Onodera said Tokyo perceived an “increasingly severe regional security environment”. On Friday, Prime Minister Shinzo Abe pitched his plan for Japan to take on a bigger international security role and told the Singapore forum that Tokyo would offer its “utmost support” to Southeast Asian countries in their efforts to protect their seas and airspace. In a pointed dig at China, he said Japan would provide coastguard patrol boats to the Philippines and Vietnam. Wang, China’s deputy chief of staff, also snubbed an offer for talks with Japan made by Defence Minister Onodera, the semi-official China News Service said. “This will hinge on whether the Japanese side is willing to amend the erroneous policy towards China and improve relations between China and Japan,” he said. “Japan should correct its mistakes as soon as possible to improve China-Japan ties.” The strong comments at the Shangri-La Dialogue come as Abe pursues a controversial push to ease restrictions of the post-war, pacifist constitution that has kept Japan’s military from fighting overseas since World War Two. Despite memories of Japan’s harsh wartime occupation of much of Southeast Asia, several countries in the region may view Abe’s message favorably because of China’s increasing assertiveness. Hagel repeatedly stressed Obama’s commitment to the Asia-Pacific rebalance and said the strong U.S. military presence in the region would endure. “To ensure that the rebalance is fully implemented, both President Obama and I remain committed to ensuring that any reductions in U.S. defense spending do not come at the expense of America’s commitments in the Asia-Pacific,” he said. US has obligations to protect Japan’s and Philippines’ interests, but Japan and the Philippines are not only unable but also unwilling to protect US interests. Japan refused US Vice Present Biden’s bitter and vigorous attempt to persuade its PM Shinzo Abe from visiting Yasukuni Shrine. Abe’s Yasukuni visit effectively foiled US plan to form an iron-triangle alliance of US, Japan and South Korea. Japan knew well the US has great interest in the alliance but willfully ignored it. The Philippines drove the US away from largest US military bases there when it thought US protection was useless, but wants US boys to shed blood to protect it now when it fears that China may take back the tiny islands it has stolen from China. Only a country stupidly pursue world hegemony will continue to protect such ungrateful allies. China was a trustworthy ally of the US, but US was not China’s ally. Now the US regards China as its major potential enemy and wants to contain China by its pivot to Asia. When the US wanted to remove Libyan strongman Gaddafi, China supported it in spite of its great interests there. China had to withdraw 50,000 workers and suffer USD billions of losses. The US just ignored that but began to contain China by its pivot to Asia. Its support for China’s opponents in maritime territorial disputes infuriated China. As a result, China put an end to its one-sided alliance with the US and began to form a Cold War alliance with Russia. China’s diplomacy works. As a result, the US has been unable to do what it wants in Syria and Ukraine and as a matter of fact, lost its global leadership. However, the US remains stupid in keeping its one-sided alliance with Japan and the Philippines and refrains to mend fence with China. It politicians do not have the vision that China has the potential to grow stronger than the US not only economically but also militarily. If the US fails to correct its strategy, China’s integrated space and air capabilities will be superior to US Air-Sea capabilities by far one or two decades later. By that time, what the US can do to remain number one in the world? Graphene may give rise to a revolution in future aircrafts and spacecrafts. Graphene is a material that most people are not familiar with but researchers in many countries are busy working on. It is a new material formally discovered in 2004, for which two British scientists Andre Geim and Konstantin Novoselov became Nobel Physics Laureates in 2010. Its special characteristics make it possible for the production of transparent mobile phone as thin as a piece of paper, batteries able to be fully recharged in a minute, bullet-proof shirt and other science-fiction products. 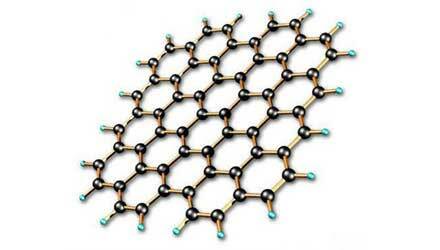 For real military application, graphene is very thin and nearly transparent pure carbon one atom thick. It is remarkably strong for its very low weight, more than 100 times stronger than steel. This makes it the best materials for aircrafts and spacecrafts. However, there is drawback: It is forbiddenly expensive, 15 times more expensive than gold. That may be a problem for the United States as it has to reduce military spending due to its huge budget deficits, but no problem for China which has an unlimited military budget. China certainly does not grudge however great spending for this revolutionary new materials in order to achieve integrated space and air capabilities. Sources related to the Industrial Aviation Material Research Institute of China Aviation Industry Corporation revealed to Global Times on May 27 that they have obtained the technology for mass production of graphene film and powder and successful used graphene to make an alloy of graphene and aluminum, the first such alloy in the world, with exceptional qualities for aircrafts and spacecrafts. China has abundant funds for military development. China’s tax income grows rapidly along with its economic growth. In addition, there is the income from state-owned enterprises at Chinese government’s disposal. Moreover, lots of corrupt officials’ assets have been confiscated in the anti-corruption campaign while the mass line campaign has greatly reduced government spending. The funds allocated to the military rise as a result of the increase in income and decrease in spending. Let me give you an example. Before the mass line campaign, a quite rich province spent three times its budget due to construction of luxurious government offices and official housing and provision of luxurious cars, banquets and travels abroad for officials. Since the campaign, such luxuries are strictly forbidden and the province has to reduce spending within its budget. Lots of funds thus saved can be used for military spending. There is still the question why shall China spend such a lot on its weapons. Because it is busy conducting an arms race with the United States in order to surpass the US in military strength. In July 2010, China reacted angrily at statements concerning South China Sea disputes by US Secretary of State Hillary Rodham Clinton during an ASEAN security gathering. China began to quicken the development of its navy, but at that time, its arms race with the U.S. did not begin in earnest. Anyway, in addition to the busy testing of its aircraft carrier, it conducted trial operation of its Beidou satellite GPS system and launched its third 071 landing platform dock (LPD) in September 2011. China launched its first 071 LPD in December 2006 and its second 071 LPD 4 years later in November 2010, but it launched the third 10 months later. In addition to putting its own satellite GPS system into trial operation, it declared its plan to launch 6 more satellites in 2012 to improve the system. Guided by this system, China’s missiles and bombs will be much more accurate. Why was the haste? Because China is conducting an arms race with America in earnest. It now wants to catch up with and surpass America in military strength as soon as possible because it believes that America wants to bully it. Therefore, he borrowed the China dream from Liu Minfu, the author of the best sellor “China Dream”. In 2009, under the influence of Maoist sinocentric cosmology, PLA senior colonel Liu Mingfu published his leftist book “China Dream: Great Power Thinking and Strategic Posture in the Post American Era” to reject reformists’ idea of China’s peaceful rise and advocate instead China’s “military rise”. Liu believes that China’s goal shall be to surpass the United States and become world number one militarily. The book was an instant success and soon sold out. However, the reformists under Hu Jintao banned reprinting of the book due to its leftist theory that pursues military hegemony. Xi Jinping expands the Chinese dream into a dream for the rejuvenation of China, but concerning the military, in the face of US military threat, Xi keeps Liu’s idea to include making China militarily powerful into Xi’s Chinese dream. Readers shall be clear that if the US continues to interfere with China’s claim to the area within its nine-dash line, a war between China and the US is unavoidable. That is because of the clash of civilizations between China and the US as described in Samuel Huntington’s gifted book “The Clash of Civilizations and the Remaking of World Order”. China regards the area as the precious legacy left behind by its ancestors. The area had been claimed by its ancestors for centuries. That is legitimate according to thousands years of Chinese civilization but unlawful according to US civilization that has a history of only a little more than two centuries. The US regards the international law adopted by the UN much later as legal basis. Can China allow the territorial waters it has had for centuries be taken away by a superpower? Certainly not. “Lagging behind leaves one vulnerable to attacks and only development makes a nation strong.” Soon after Xi published his idea about Chinese Dream, reprint of Liu Mingfu’s book was allowed. In Chinese view, China is now developing the capabilities to resist the bully from a superpower. In fact, the US has enough financial resources if it conducts arms race with China wisely, but it wastes its precious resources in its outdated strategy of Air-Sea Battle. With exceptionally good materials such as graphene, China will develop a hypersonic aerospace bomber carrying more than 100 hypersonic missiles to destroy US Air-Sea capabilities in minutes. Why can an aerospace bomber carry more than 100 hypersonic missiles? Because such missiles on the bomber are flying at the hypersonic speed of Mach 22 along with the bomber. They need no fuel for their speed but the little fuel to control them to hit their targets. There is no defense against such hypersonic missiles in the near future. If the US does not change course, it is doomed to be defeated in future war with China. Chinese navy has significantly expanded its submarine fleet due to recent very fast development. According to news published by Chinese official source not long ago, a newest improved version of Type 041 Yuan class diesel powered submarine is recently ready for sea trial. Since its photo appeared for the first time on the Internet in December 2013, Chinese officials have for the first time admitted the existence of the improved version of Type 041 submarine. It was made by China State Shipbuilding Corporation. Its sail hull is very similar to the modernized submarine produced by Germany. In the sail hull, there may be an additional high-accuracy sonar. The improved version may hopefully have a displacement of 3,500 tons. 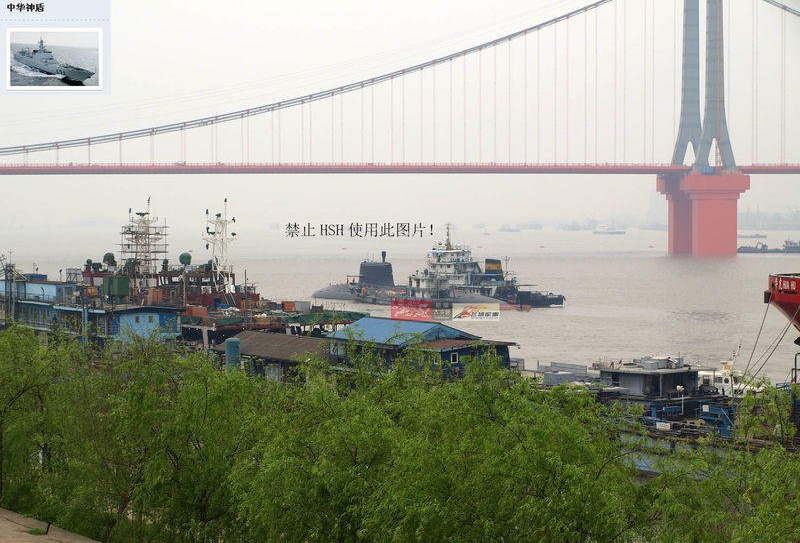 Since 2004, China has built 12 Type 041 submarines. Some US experts believe the total number of such submarines built will reach 20. Those submarines are all installed with the new-type AIP system. At the same time China is marketing its export version of Type 041 submarines codenamed S-20 with a displacement of 2,300 tons. U.S. Pacific Command Commander Samuel Locklear said on March 25, 2014, China has substantially strengthened its submarine capabilities. It will have 60-70 submarines in the next decade, quite a huge scale for a regional power. 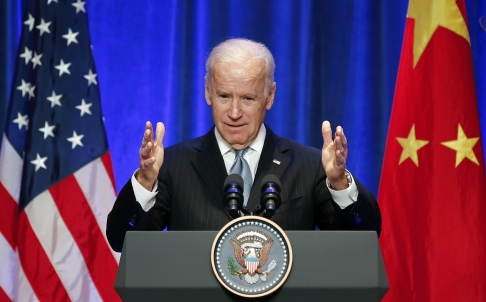 At the same time, he pointed out that China continues to build nuclear submarines that are able to carry JL-2 ICBMs. He said, “China may possibly obtained effective nuclear deterrence by the end of 2014.” According to speculation, JL-2 missiles will mainly be carried by Type 094 Jin class nuclear submarines. So far there are at least four 094 submarines in service. According to Jane’s Defense Weekly’s estimate, now Chinese navy has 4 ballistic missile nuclear submarines, 5 attack nuclear submarines and 53 diesel powered submarines. Some Western experts pointed out, Russia and China are now jointly developing and producing Lada class submarines and conducting negotiation on development of new conventional submarines on the basis of Lada submarine. That indicates China’s great desire for further improvement of its submarines. Obama does not know that to be global leader he shall have strong and trustworthy allies. China used to be his trustworthy ally. The most convincing evidence was China’s unselfish support for Obama’s actions in Libya. China suffered serious losses for that. However, Obama looked down on such a trustworthy ally and turned it to Russia’s side by his foolish pivot to Asia aimed at containing China. America began to lose world leadership due to its lost of a vital ally China. It could not do what it wanted to do in Syria due to joint Russian and Chinese veto—the first sign of its losing global leadership. It cherishes Japan as its major ally in the world, but Japan is by no means a trustworthy ally for the US. Vice President Biden spent one hour but failed to persuade Japanese Prime Minister Shinzo Abe from visiting Yasukuni Shrine. The visit created South Korea’s bitter enmity against Japan. Japan has thus foiled US plan to form an alliance with Japan and South Korea to counter China. One is not the leader because of his talks about his leadership. One is the leader because others follow his leadership. Three powers China, Russia and Japan have refused to follow US leadership on major issues. Can Obama keep on boasting US global leadership? The situation has grown from bad to worse. With China as a strong ally, Russia has been trying hard to regain the leadership of the former Soviet Union first by openly challenging the US in protecting Snowden and then by taking away Crimea from Ukraine. Russia has recently set up its new Eurasian Economic Union, which together with the Shanghai Cooperation Organization and the Conference on Interaction and Confidence-Building Measures in Asia (CICA) forms a growing little clique under Russian leadership. Obama talked much how with sanctions he has contained Russia. However, has his sanctions made Russia return Crimea to Ukraine? Can he be sure that other parts of Ukraine will not split from Ukraine due to his sanctions? The world needs US leadership, but Obama lacks the qualities to be world leader. Domestically, he has not been able to overcome US economic problems to give US the economic strength to be world leader. Internationally, he does not know to keep trustworthy allies but attach importance to mean allies that remain close to the US when they need the US to fight for their interests but drive the US away when they think that the US is no longer useful. Japan and the Philippines are the best examples. Japan conducted the terrorist attack against Pearl Harbor causing casualty similar to 911, but does not repent. It is now heroizing Japanese pilots who conducted suicide attack at US warships during World War II. The Philippines drove US troops away when it believed that they were useless. Now it wants US boys back to shed blood for some tiny islands it wants to grab from China. With such allies, the US has problems to be global leader even when it has the strongest economy in the world. 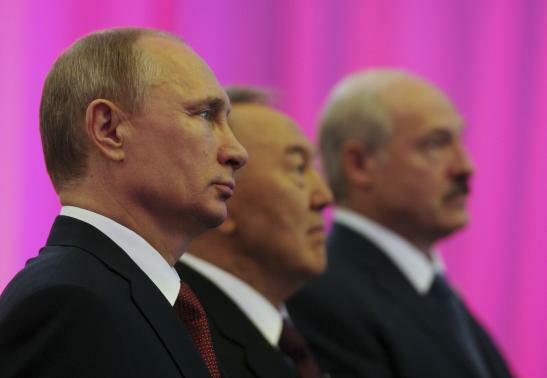 Russian President Vladimir Putin (L), Kazakh President Nursultan Nazarbayev (C) and Belarus President Alexander Lukashenko stand for a photograph before a meeting of the Eurasian Economic Union in Astana May 29, 2014. Putin formally set up its new Eurasian Economic Union as the beginning of the realization of his dream to restore the Soviet Union. However, as pointed by Reuters in its report “Ukraine’s empty seat at table darkens party for Putin’s new ex-Soviet bloc”, Putin is frustrated by his inability to include Ukraine in the Union. If he could have included Ukraine, the Union would have looked quite like the Soviet Union even without most of the other former constituent states of the Soviet Union as it would have been included the most important parts of the former Soviet Union. Since Ukraine is so important for the realization of Putin’s dream, this blogger does not believe Putin will easily give up. He would strive to get as large part of Ukraine as he can get. In fact, one of the functions of the Union is to take in the parts of Ukraine that want merge into Russia but Russia would not annex for fear of further West sanctions. This indicates that the confrontation between Putin and the West will go on until Putin finally finds himself unable to get any more from Ukraine. It will certainly be good news for Putin’s major ally China as Putin will continue to divert US pivot to Asia that aims at interfering with China’s maritime territorial disputes in the South China Sea. It will provide further returns to China’s diplomacy of forming a Cold War alliance with Russia to counter the United States, which is described in greater details in my post yesterday titled “Obama Strengthening Russia-China Cold War Alliance by His Recent Speech”. Russian President Vladimir Putin welcomed Kazakhstan and Belarus on Thursday into a new Eurasian Economic Union built to rival the United States, EU and China – but the absence of Ukraine undermined his dream of restoring Soviet glory days. Although Putin denies he is trying to rebuild the USSR, he makes no secret that his dream is to reverse the consequences of its breakup by drawing former Soviet states closer together. The signing ceremony, held in Kazakhstan’s new oil-funded boomtown capital Astana, was his biggest step yet in realising that goal. But events since February – when a pro-Russian leader was toppled in Ukraine, Putin responded by seizing Ukraine’s Crimea peninsula and the West imposed sanctions – have cast a pall over the new union’s birth. The Eurasian Economic Union that has taken shape after years of planning is a shadow of the economic powerhouse Putin once dreamed of, snubbed by most former Soviet states and dominated by a Russian economy that is itself sliding into recession. Still, the new union has a market of 170 million people, a combined annual GDP of $2.7 trillion and vast energy riches, and it can be held up by Putin to show Western sanctions imposed over the annexation of Crimea will not isolate Russia. The treaty deepens ties forged when the three countries took the initial step of creating a customs union in 2010. It guarantees the free transit of goods, services, capital and workforces and coordinates policy for major economic sectors. “Our meeting today of course has a special and, without exaggeration, an epoch-making significance,” Putin said of the treaty, signed to loud applause from rows of seated officials. His reference to sovereignty was telling because Kazakhstan fought hard during negotiations to ensure it did not give up any of the independence it won as the Soviet Union collapsed, scotching Russian hopes of creating a political union. Kazakh President Nursultan Nazarbayev, seated at a long white desk at which he, Putin and Belarusian President Alexander Lukashenko signed the treaty, said the union would be an “economic bridge between the East and the West”. Lukashenko darkened the party’s mood by mentioning the most important of the guests that stayed away. The Eurasian Economic Union will formally come into force on Jan. 1 once approved by the countries’ parliaments, a formality for three presidents that have no serious internal opposition. The union – an idea first raised by Nazarbayev in 1994 but widely ignored at the time – brings to life Putin’s dream of uniting like-minded countries, capitalising on the nostalgia of many Russians for the order and relative economic and political stability of the communist Soviet empire that collapsed in 1991. Putin noted that Kazakhstan and Russia accounted for one-fifth of the world’s natural gas reserves and 15 percent of oil reserves – although Belarus’s struggling economy looks like a burden for Astana and Moscow. The new union reinforces Putin’s drive to show Russia will not be isolated by sanctions, a message he sent by reaching a $400-billion gas supply deal with China last week. But any hopes of rebuilding a large part of the Soviet Union have been thwarted by Ukraine, with some 45 million people, by far the most populous ex-Soviet state after Russia itself. That blow, in the words of ex-Kremlin spin doctor Gleb Pavlovsky, makes Putin’s original dream “impossible” to fulfil. Armenia and Kyrgyzstan, both tiny and poor, are considering joining. But other ex-Soviet republics, including big energy producers Azerbaijan and Turkmenistan, have steered clear. Shortly before the treaty was signed, Russia’s biggest bank reported an 18 percent decline in profits in the first quarter and more than doubled its provision for bad loans, with sanctions and instability caused by the Ukraine crisis partly to blame. The creation of the new alliance also involves costs for Russia. Deputy Finance Minister Sergei Shatalov told Reuters in March that Belarus and Kazakhstan received about $6 billion annually from Russia in direct and indirect support, and said that could increase by $30 billion if all trade restrictions were lifted in 2015 after the union is created. As soon as China learnt America’s plan to contain it, it switched to Russia’s side by joining Russian veto over Syria issue. Subduing the enemy by stratagem is the best of best; by diplomacy, the second best, by fighting in the field, the third alternative; by attacking cities, the last resort. China has adopted the stratagem to subdue the United States since 2004 when it decided to obtain integrated space and air capabilities for its air force. It was disclosed in China’s Air Force Encyclopedia a year later, but when China’s Central Military Commission Chairman Xi Jinping recently urged the air force to obtain such capabilities, foreign media regarded it as something new. It proves people outside China’s ignorance about China. Such ignorance may lead to underestimate of China’s determination and strength that decades ago caused the defeat of the best equipped US troops by the poorest equipped Chinese troops at the beginning of the Korean War. Due to such ignorance American strategists proposed the Air-Sea Battle to deal with China, but are not aware that it is an outdated strategy adopted by the US in the 1940s in defeating Japan. Are they really ignorant that we are living in the space era now? Are they recently unearthed terracotta warriors? Regarding the second best, China adopts the diplomacy of establishing a Cold War alliance with Russia. It requires mutual trust for such alliance. First, who should be the leader of the alliance? By passing Snowden to Russia, Xi Jinping gave Putin a clear signal, Putin is the preferred leader of the alliance as Xi believed that Putin was not afraid of challenging the United States, the target of their alliance. Putin proved his qualities as the leader and did infuriate the US by protecting Snowden. There was still inadequate mutual trust to make the alliance a real one. Due to lack of trust, the two countries have not been able to conclude a contract on sales of natural gas until now in spite of a decade of negotiations. Due to lack of trust, they have not been able to cooperate in developing large aircrafts and heavy helicopters for nearly two years until now since they signed an agreement on that. Due to lack of trust, Putin had been trying hard to improve relations with Japan in spite of the intensifying tension between China and Japan over some small islands and Japanese Prime Minister Shinzo Abe’s visit to Yasukuni Shrine. Fortunately for China, the EU and United States ignored the clear indications by Xi’s busy visits to Russia of his desperate efforts to form a close alliance with Russia. They initiated the Ukraine crisis that provided China with the opportunity to prove China is Russia’s trustworthy ally. Putin meant: Russia and China are closer allies than they were in the early 1950s when Russia was a part of the Soviet Union. However, there was a treaty of alliance between China and Soviet Union at that time, but there is none now. But perhaps treaty is not so important for the allies. In the 1960s, China and the Soviet Union became bitter enemies in spite of the treaty. In order to win Russia’s support in China’s dispute with Japan, Xi Jinping said in a speech he gave when he visited Russia in March 2013, that China and Russia shall jointly preserve the achievements of the victory of World War II and maintain the international order after the War. Xi meant that as Russia got the four islands in dispute with Japan due to World War II, China supported Russia in the dispute. On the other hand, as Japan returned Taiwan to China due to its defeat in World War II, it shall give back to China the Diaoyus (called Senkakus by Japan) as the Diaoyus are a part of Taiwan while Taiwan is a part of China. But Russia failed to respond as Putin was trying to improve Russian relations with Japan. However, due to closer alliance, this time Putin gave favorable response. To reporter’s question: In 2015, our countries will celebrate the 70th anniversary of Victory over fascism. What is the impact of joint Russian-Chinese efforts to oppose the attempts aimed at challenging the results of World War II? Putin said in his reply. “Next year we will hold a range of joint events to mark the 70th anniversary of Victory both in the bilateral and the SCO format. During these events, youth will be in the focus of our work. What he said has been written into the first part of his joint statement with Chinese President Xi Jinping on May 20, 2014. Did he really believe that the US was strong enough to fight both Russia and China? At least, we should say that China’s diplomacy is an unqualified success. The US wanted to switch its focus to China by its pivot to Asia. Now, China has diverted the pivot to Russia by its diplomacy. On the other hand, Obama proves his miserable lack of diplomatic skill by his speech. What is the precious legacy left by Chinese people’s predecessors? The vast land, the culture, philosophy, knowledge, technology, experience in their long history, etc. What people often neglect is the vast sea area within the nine-dash line. What is the use of the waters? No crops can grow there. Fishery, fish farming and alga farming may be more profitable than agriculture on the small proportion of land for agriculture on China’s land area, which is mostly deserts, mountains and very high plateaus. Only less than 10%, i.e. 0.96 of the 9.6 million square km, of China’s land area can be used for farming. The sea within the nine-dash line has an area of 3.5 million square km that can all be used for fishery and fish and alga farming. In addition, we all know that there are rich oil and gas resources there. However, we still do not know what rich mineral resources there are at the bottom of the sea. Chinese people certainly have to keep the rich legacy left by their ancestors. Shall China Fight Six Wars for “Reunification”? Amid surge of nationalism due to maritime territorial disputes in the East and South China Seas, a naïve girl Li Qiuye wrote an article entitled “Six Wars China Is Sure to Fight In the Next 50 Years”. Unexpectedly, the foolish article was quite popular and lots of Chinese media accept Li’s views. The six wars are: The war to take Taiwan for reunification; with Russia for recovery of 2 million square km ceded to Russia by a treaty, the war with Mongolia to annex it as it was a part of China before 1924 and gained independence due to Soviet influence; the war with India for disputed land areas of some 100,000 square km, the war with Japan for disputed uninhabited small Diaoyu (known as Senkaku in Japan) Islands; and the war for disputed islands in the South China Sea that may involve Vietnam and the Philippines. Li regards the six wars as wars for reunification, but only the war with Taiwan was really for reunification while the wars with Russia and Mongolia are for recovery of lost territories and those with Japan, India, Vietnam, etc. are to resolve territorial disputes. France and Germany fought for nearly a century for the disputed Alsace-Lorraine area, which was even one of the causes of world wars. Neither France nor Germany is so stupid as to fight on. They finally decided to set up the EU to put an end to the dispute forever. Is China wise to fight wars to turn most of its neighbors into its enemies? What will China get even if it wins all the wars? First, the most important issue–the reunification with Taiwan. Reunification by force will bring China no benefit as Taiwan has little resources and no cheap labor. The damage done by the war will cause China not only to lose a substantial market but incur the heavy burden of feeding 20 million Taiwan people and maintaining their high living standards. Moreover, Taiwan is an island full of hills favorable for guerilla wars. The financial burden and the guerilla wars will make the Chinese regime unpopular and even collapse. Li does not understand that the driving force is interest instead of the lofty slogan of reunification. Russia, Mongolia, India and Japan will make every effort to recover the territories taken by China. There will be no end of wars with them. China will get nothing from those recovered barren territories and islands, but will incur lots of expense in defending the recovered territories. Obviously the third alternative battles in the field and the last resort of attacking cities will not bring any benefit to China. Of the six wars, four will be fought against or involve very strong countries: Russia, India, Japan and the United States who has obligation to protect Taiwan. If China fought the four countries within the said five decades, China will have troubles for centuries. Taking back the islands and waters in the South China Sea is quite different. The countries that contend with China for the islands and waters are all small and militarily weak. Even if China fight wars with them to take back the islands and waters, China will not have much trouble after the wars. The country that may interfere is the United States, which has adopted its pivot to Asia to contain China, but China has so far successfully countered it with the establishment of the above-mentioned Cold War alliance with Russia. Foreign media are fond of listing Taiwan, Vietnam, the Philippines, Malaysia and Brunei as contenders for the islands and waters. They treat Taiwan as a country separate from China as they hope so to make China less strong; therefore, they just ignore the fact that both China and Taiwan hold that there is only one China. Taiwan regards itself as China and the China on Chinese mainland as a part of it while China regards itself as China and Taiwan as a part of it. If those contenders are willing to return to Taiwan what they have taken from China, China will certainly welcome such moves. Then the maritime territorial disputes with those contenders will become an issue of the reunification of China. Certainly, however, those contenders will never take such moves. It is easy for Chinese navy to defeat all the navies of Vietnam, Malaysia and the Philippines at the same time to recover those islands and waters, but that will be the third alternative. “Subduing the enemy without fighting is the best of best,” said Sun Tsu in his The Art of War. I believe that China shall certainly choose diplomatic instead of military solution of the problems. It shall first reach an agreement for sharing resources with one or two of the four contenders. It seems that Malaysia and Brunei may be willing to accept such a solution. With the satisfactory examples set by the two contenders, Vietnam under Russian influence may follow suit. Then there is only the Philippines left. Simple naval blockade of the islands occupied by the Philippines will do. There is no need to fight. The South China Sea within the nine-dash line involves too great interests, China certainly shall not cede even one inch of it. However, as alliance with Russia may prevent US interference, China can resolve the issues at will. It needs not wait till it has integrated space and air capabilities to surpass the US. China claimed the sea area within its nine-dash line long before the Law of the Sea Convention was adopted by the United Nations. The line appeared in China’s map published in the 1940s and the US has not had any objection until now when it wants to contain China. Obama may think that he has justified reason to interfere, but the United States has not even ratified the Law of the Sea Convention. How can it act on the basis of the law? President Barack Obama warned that the US was ready to respond to China’s “aggression” toward its neighbours at sea, but said Washington should lead by example by ratifying a key treaty. 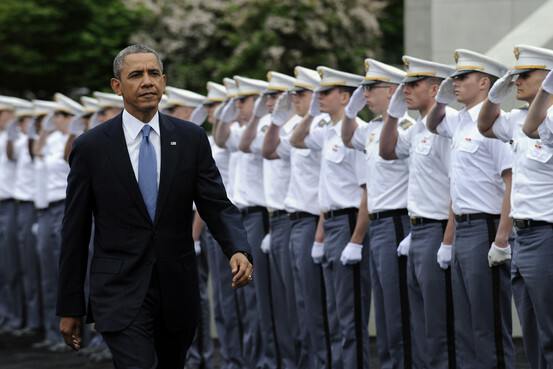 WEST POINT, United States: President Barack Obama warned on Wednesday that the United States was ready to respond to China’s “aggression” toward its neighbours at sea, but said Washington should lead by example by ratifying a key treaty. 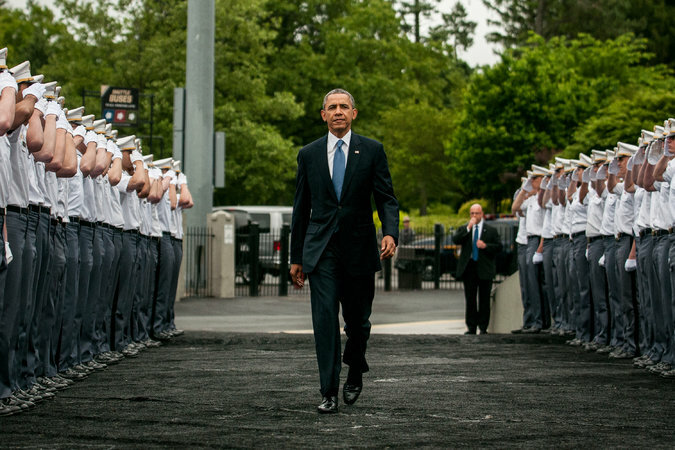 In a wide-ranging speech on foreign policy to US military cadets at West Point, Obama said that the United States should shun isolationism and that its military must be prepared for crises. “Regional aggression that goes unchecked – whether it’s southern Ukraine, or the South China Sea, or anywhere else in the world – will ultimately impact our allies, and could draw in our military,” Obama said. “We can’t try to resolve the problems in the South China Sea when we have refused to make sure that the Law of the Sea Convention is ratified by the United States – despite the fact that our top military leaders say that the treaty advances our national security,” Obama said, not naming China directly as he diverted from his prepared text. “That’s not leadership; that’s retreat. That’s not strength; that’s weakness,” Obama said. Senators of the rival Republican Party have refused to ratify the treaty, saying that the United Nations (UN) convention would override US sovereignty. Tensions have been rising for months between China and its neighbours at sea, with Vietnam on Tuesday accusing Beijing of ramming and sinking one of its fishing boats in the South China Sea. Japan and the Philippines also have tense disputes at sea with China. Japanese commentators have voiced concern that the US failure to prevent Russia from annexing Ukraine’s Crimea peninsula in March sent the wrong signal to China. “Progress there could be reversed. But if Burma succeeds, we will have gained a new partner without having fired a shot,” Obama said. Myanmar has freed political prisoners, eased censorship and welcomed foreign investors, but human rights groups have voiced alarm over violence against the Rohingya minority.